Quentin Snediker, Shipyard Director, Clark Senior, Curator for Watercraft at Mystic Seaport, and Whit Perry, Plimoth Plantation’s Director of Maritime Preservation and Operations and the Captain of the MAYFLOWER II, will present the challenges and triumphs of the on-going restoration of the ship. 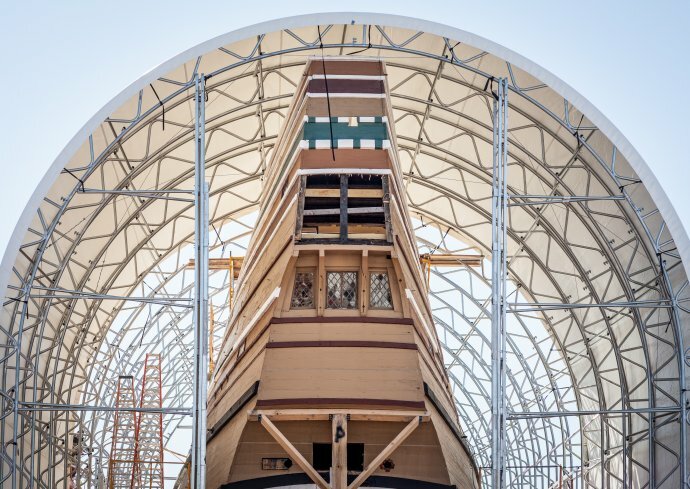 This multi-year project is a collaboration of shipwrights from both Mystic Seaport and Plimoth Plantation in preparation to take MAYFLOWER II back to sea in connection with the celebration of the 400th anniversary of the Pilgrims’ arrival in Massachusetts. Visitors can view the progress of the project in the Henry B. duPont Preservation Shipyard. The talk will be held at 1:30 p.m. in the River Room, Latitude 41° Restaurant & Tavern, 105 Greenmanville Ave., Mystic and at 6:30 p.m. at StoneRidge Senior Living Community, 186 Jerry Browne Road, Mystic. StoneRidge is the exclusive sponsor of the 2017-2018 Adventure Series.